From the twisted mind that brought you the award winning short film “Roid Rage,” comes an original creature-feature that is sure to get pulses racing in the horror community - ALL THE DEVILS ARE HERE. Bahamian filmmaker Ryan Lightbourn has recently debuted this film festival hit on a wide range of digital outlets. ALL THE DEVILS ARE HERE (formerly titled Sleepwalkers) tells the story of five college students as they attempt to enjoy a debaucherous spring break getaway. As a series of horrific events surfaces, the group joins forces with a local convenience store owner and a prison escapee. With nighttime approaching, they must set aside their differences and use their wits to survive in this synth-fueled love-letter to 80’s & early 90’s B-movies. The film stars Ansley Gordon, Tommy Goodman, Ben Evans, Ben Owen, J. LaRose and Amanda Dela Cruz. 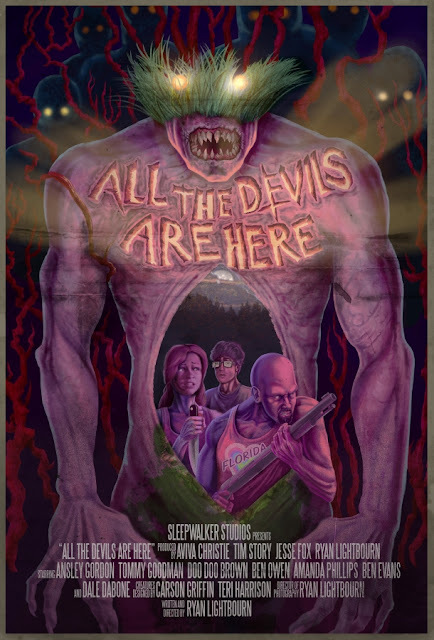 ALL THE DEVILS ARE HERE can currently be found on most VOD platforms. Platforms include: iTunes, Amazon, Google Play, VUDU, Sony Playstation, XBox Live and many others. You can check out the latest trailer below along with the film’s official movie poster. Keep up to date with all things ALL THE DEVILS ARE HERE by giving the Facebook page a LIKE.